Top 2019 NCAA Tournament Storylines - College Hockey, Inc. Ten schools chase their first title in a tournament with a unique field. Minnesota Duluth hopes to become the first repeat champions since Denver in 2004 and 2005 (Photo by Larry Radloff). 10 of the 16 teams have never won a championship, including three of the top four seeds (and nine of the top 12 seeds). Multiple teams are making their first appearance (American International, Arizona State) for the first time since 2007. None of the top five schools in all-time appearances made the field (Michigan, Minnesota, Boston University, Boston College, North Dakota), nor did the top seven schools in all-time tournament games played (those five plus Wisconsin, Michigan State). Ten schools have won three or more titles and only one of those is in the field (Denver). Boston College, Boston University, Michigan, Minnesota, North Dakota and Wisconsin have all won five or more titles. This is the first time in 50 years and only the second time ever that none of them are in the tournament (the 1969 tournament featured Denver, Cornell, Harvard and Michigan Tech). 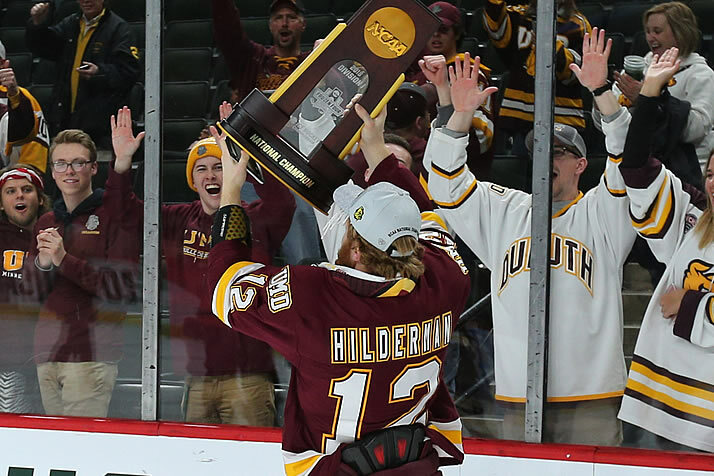 Repeat after me – Minnesota Duluth seeks to become the tournament's first repeat champion since the Denver teams of 2004 and 2005. The Bulldogs went 8-6-0 against the rest of the field in the regular season, the most wins vs. the field of any team. They are the only school to win multiple titles in the last eight years (2011, '18). Denver and Providence are the only other schools that have made the field at least five years in a row. View the future – Thirty NHL teams have at least one draft pick in the tournament, with a total of 70 drafted players on the 16 rosters (American International and Minnesota State are the only teams without an NHL draft pick). Tampa Bay and Vegas are tied for the most draft picks in the tournament with five each. Providence (9), Notre Dame (8) and Minnesota Duluth (7) have the most draft picks on their rosters. In just the last year, 19 players who played in the 2018 NCAA Tournament have already played in the NHL. Forty-eight NCAA schools have had a former player in the NHL this season, including 14 of the 16 teams in the tournament (American International and Arizona State are the exceptions). Thirty-two percent of all NHL players developed in NCAA hockey. Year of the D – This has been the "year of the defenseman" in college hockey, with a record six of 10 Hobey Baker Award finalists playing defense. Four of those six are in the tournament, led by two of the nation's top eight scorers in Harvard's Adam Fox (48 points) and Massachusetts's Cale Makar (46), who will meet in the first round. They are both contenders to lead the nation in points, something no defenseman has ever done. Last season, the top-scoring defense corps entered the NCAA Tournament with 107 points. This year four groups have more points than that, led by Quinnipiac (147). Scoring race down to the wire – The NCAA scoring race rarely comes down to the NCAA Tournament, but it likely will in 2018-19. The current national co-leaders have 50 points but are not in the field; six players who are still playing, however, are within five points of the leaders. Hobey hopefuls – Seven of the 10 finalists for the Hobey Baker Award are in the tournament, with six of them in the half of the bracket featuring the West and Northeast Regionals. Minnesota, nice – The state of Minnesota produced three of the top four seeds in the tournament, plus more players in the field than any other state or province. The 68 Minnesotans are more than twice as many as the next closest states (Illinois and Massachusetts, 32), with 13 teams featuring at least one player from the state. Upset specials – Four seeds have enjoyed success in the tournament lately, recording nine first-round upsets in the last six years combined. Five No. 4 seeds have reached the Frozen Four in that time and two have won the NCAA title. Three of the six teams in the field that have won championships in the past slot in as No. 4 seeds in their regions. European influence – A record number of Europeans played Division I this season (110) and 13 countries outside of North America are represented in the NCAA Tournament. Twelve of the 16 teams have at least one European on their rosters, led by American International with 11. Two Germans lead their teams in scoring (Marc Michaelis, Minnesota State, and Nico Sturm, Clarkson), while as many as four starting goaltenders in the first round could hail from Europe. The West Regional alone could feature three European starting goaltenders. Turnaround artists – Massachusetts and American International are separated by 22 miles in Western Massachusetts, and they have followed similar paths to the 2019 NCAA Tournament. In 2016-17, the first year for both coaches at their programs, they went a combined 13-49-10 (.250 winning percentage). This year both won their first conference regular-season titles (with AIC adding the tournament title) and combined for a 50-25-1 mark (.664). Head coaches Eric Lang and Greg Carvel were both named coach of the year in their respective conferences. First timers – Six head coaches are making their first NCAA Tournament appearances, including David Carle (Denver) and Brett Larson (St. Cloud State) in their first seasons at their schools. Only three coaches in the field have led teams to national titles in their careers: Jeff Jackson (Notre Dame), Scott Sandelin (Minnesota Duluth) and Nate Leaman (Providence). Three teams in the regional (Massachusetts, Harvard, Clarkson) feature a Hobey Baker finalist … Harvard (1989) is the only school in the group to have won a national title … Clarkson-Notre Dame is the only first-round matchup featuring two conference tournament champions, the second year in a row the Irish have opened against a fellow conference tournament champion … Cale Makar and Adam Fox could become the first defensemen to reach 50 points since Wisconsin's Brendan Smith (52 in 2009-10) … Harvard (28.8%) and Massachusetts (28.7%) boast the top two power plays in the country … Clarkson has the tournament's top record vs. other teams in the field (6-2-1) and the longest active unbeaten streak (7-0-2) … Three New Hampshire natives – Harvard's Reilly Walsh and Notre Dame's Alex and Matt Steeves – are returning to their home state. The top three career point scorers (Mason Jobst, Robby Jackson, Patrick Newell) and goal scorers (Jobst, Jarid Lukosevicius, Jackson) will be in Fargo; seven of the 15 100-point scorers in the field are in the West … As many as three starting goaltenders could be Europeans … Three of the six head coaches making their NCAA Tournament debut are in Fargo … St. Cloud State (nine seniors) and Ohio State (eight) have the most seniors of any teams in the tournament and the two highest scoring senior classes … St. Cloud has two North Dakotans (Jacob Benson, Jon Lizotte) returning to play in their home state … American International makes its first tournament appearance in Eric Lang's third season; the program had never posted a .500 season at the Division I level before. This region has the most NHL draft picks of the four (20), even though top-seeded Minnesota State has none … Minnesota State boasts the most wins in the country (32) and the best record since Christmas (18-3-2) … Minnesota State and Providence are two of the nation's top five teams in goals against per game … Minnesota State's first tournament appearance (2003) was also in Providence … Providence opened its 2015 NCAA championship run as the No. 4 seed in the Providence regional … Northeastern makes its seventh tournament appearance and first in consecutive seasons, despite losing two of the nation's top three scorers from last season … Cornell has made three straight tournaments for the first time since making four straight (and winning two titles) from 1967-70. The Bowling Green-Minnesota Duluth first-round game is a rematch of the longest NCAA championship game in history, which the Falcons won in 4OT in 1984 … All four starting goaltenders are juniors, and all five leading scorers (Minnesota Duluth has co-leaders) are sophomores … The second game the nation's top goaltenders in save percentage (Quinnipiac's Andrew Shortridge, .941) and shutouts (Arizona State's Joey Daccord, tied with 7) … Bowling Green's Connor Ford (Pittsburgh) and Arizona State's Austin Lemieux (Sewickley) are playing in their home state. St. Cloud State is the first school in the current tournament format to earn the No. 1 overall seed in consecutive seasons … There are no regular-season rematches in the first round for the first time in at least six years … Four conference championship games were decided in overtime, the most ever in one season … Four ECAC Hockey teams are in the tournament for the first time since 1984 … The last 10 championship games have featured 15 different schools, only five of which are in the tournament … Four teams in the field have posted win improvements of at least seven over last season: Arizona State (+13), Massachusetts (+11), Quinnipiac (+9) and American International (+7).